Look at them poor old brown floppy bananas sprawled out across the fruit bowl. The whiff alone of an old banana is enough to make some gag, but what if I told you, that with little effort, a little love and a few extra ingredients, you could turn them into something super delicious, something that smells amazing and something that contains NO added sugar. Did you know : It has been estimated that 1.4 million bananas get wasted every day around the world. There is absolutely no excuse for throwing a spotty and dark banana in the bin. They are so versatile. Throw them in smoothies, freeze them for cool snacks, mix in with porridge or do as I have done below, mash it and bake banana bread. 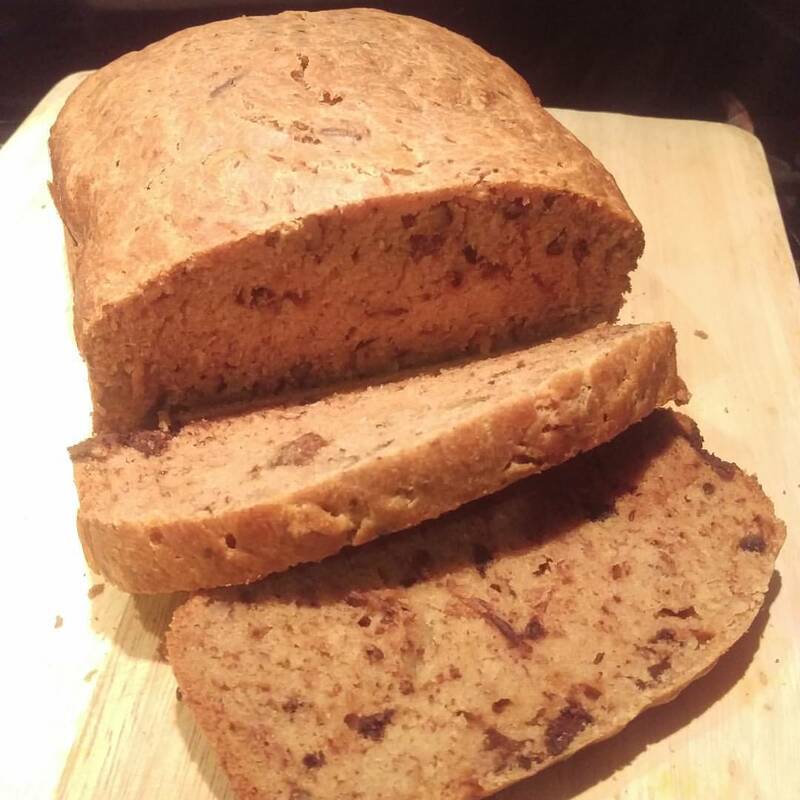 Once you have tasted this delicious Banana Bread you will never throw bananas away again, just because they are ‘old looking’. You may even find yourself scouring the reduced fruit section in your local supermarket, in hope of finding a bargain bunch of bananas from as little as 5p!! (believe me,it does happen. Asda are great for this!). Also’old’ bananas have many more health benefits. The riper they get they better the nutrients get. Strengthen your blood and relieve anaemia with the added iron from bananas. High in potassium and low in salt, bananas are officially recognised by the FDA as being able to lower blood pressure and protect against heart attack and stroke. Constipated? High fibre in bananas can help normalise bowel motility. Eating a banana between meals helps stabilise blood sugar and reduce nausea from morning sickness. Teeth Whitener: Rub the inside of your banana peel on your teeth to whiten them. Apparently, the manganese, magnesium and potassium helps whiten the enamel of your teeth. Splinter Removal: Banana peels help ease splinters out of your skin. Place banana peel on a splinter with athletic tape for a while and then try to ease the splinter out. Rose Food: Here are a few great recipes for feeding your roses with banana peels that are rich in calcium and magnesium, as well as many other trace minerals that your flowers love. Tomato Plant Fertiliser: Wrap a banana peel around your tomato starts when you plant them in the garden and they’ll enjoy the nutrients from the peel as they grow throughout the summer. So this is my Thrifty Thursday gift to you. A delicious recipe that can save bananas from the bin, provide you with so many beneficial nutrients that help lift your mood and give you energy. It can be baked in a bread machine or oven and is guaranteed to fill your home with a tasty aroma…….bon appetit! Pour eggs, butter, milk and bananas into the bread pan and set it aside. In medium bowl stir together all dry ingredients. Pre heat oven to 180°C and and butter a 4 x 8-inch loaf tin. Mix eggs, butter, milk and bananas in a bowl and set it aside. Add wet mixture to the dry ingredients and lovingly combine. Pour the mixture into your loaf tin. Bake for 50 minutes to 1 hour at 180°C, or until a tester inserted into the centre comes out clean. Remove from oven and cool completely on a rack. Remove the banana bread from the tin. Slice and serve. replace the 1/2 cup of chocolate chips with some dried fruit…. WOW thanks for all the good info! I had no idea that the peel had so many wonderful things it could help with! Yum, I so love banana bread. This looks so delicious! Banana bread is so good! I really love to bake but I have never attempted it. I should be a little more brave and just try it out! Thanks for the post. I love banana bread, it’s one of my favourite snacks! I’ll have to give your recipe a try, dark chocolate and walnuts sounds amazing! This banana bread looks so good! I am going to try this over the weekend! Funny our bananas are getting old! So this is perfect timing! Bananas are awesome, it’s packed with so many health benefits and it has so many uses as well. There are a lot of desserts that you can make with it, plus it’s one of my favorite ingredients in smoothies. I think making banana bread is a great idea especially when the bananas are too ripe. I’ve always wanted to make banana bread, but haven’t tried to. These recipe seems pretty easy to follow. Now all I need are walnuts and two ripe bananas — I have everything else! I love banana bread, my mom’s recipe is something that I constantly crave for. I would love to try this one too. I think bananas are packed with a lot of benefits, it’s super healthy! Yes, more potassium for me! I like how it makes me crave for it, and I really can’t get enough of dark chocolates. Always liked their taste! I did not know bananas had so many benefits. I love eating them and encourage my toddler to. I know my mom would like the banana bread recipe. Banana bread is one of my favorite things to make. I’ve never put dark chocolate in mine. I shall trythis! I love bananas too and always make sure they don’t go to waste. We use them in smoothies and our for er flatmateused to make us banana bread too.